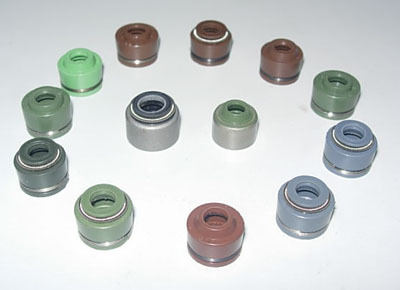 We are COS Plastic & Rubber Co. , Ltd. A leading oil seal manufacturer in China. We have over 20 years experience in producing rubber products. Also we are able to make new ones base on customer’s sample or drawing. All parts we make base on TS16949. We have confidence COS can be your best supplier. The most important component of an oil seal is the material. * maximum temperature limits depend on other operating conditions. Commonly chosen as high temperature replacement for Nitrile or Polyacrylate. Fair resistance to water, dry running. Low temperature resistance is fair. POLYACRYLATE Polymerised acrylic acid esters or PA and ACM. Good resistance to mineral oil, hypoid gear oil E. P. additive, greases, aging and flex cracking. Poor cold temperature limit, dry running ability, water resistance. Good resistance to petroleum oils, water, silicone oil, greases. Good abrasion resistance, tear resistance. Poor resistance to ozone and weather aging. Resistant to compression set. Low resistance to hydrocarbon fluids like gasoline or paraffin fluids or steam above to 50 psi.